With the recent volatility of the stock market, and all of its ups and downs, I discovered an interesting story while studying finances. Even though the prices of both gold and silver have fallen over the last year, the price of a particular group of nickels has not declined in value. This 5 cent group of 1913 Liberty Head “V” nickels have held their value because only five of them exist. George Walton owned one of these nickles, and his was sold by Heritage Auctions in April 2013 for a then-record $3.1 million. Walton had purchased his nickle in 1945 for $3,750. Convinced that he had just purchased a rare treasure, Walton had the coin appraised; however, the nickel was rejected as a fake. Walton still saw the beauty and the value in the coin, so he kept it in his coin collection. About 20 years later, Walton was on the way to a coin show, but was killed when his car was struck by a drunk driver. In 2003, a family member took the coin to the 2003 ANA World’s Fair of Money in Baltimore, where experts authenticated it as 1 of only 5 of the rare nickels known to exist. 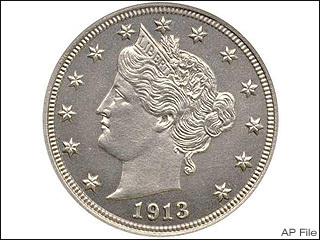 In 2013, Walton’s 1913 Liberty Head “V” Nickel sold for $3.1 million. Some people spend their lives in a currency of criticism. They never see the silver lining in any cloud. Instead of seeing beauty marks, they see every wrinkle on a person’s face. Their life is a constant focus on the negative instead of the positive. Then, there are the George Waltons of the world. They see the beauty that no one else sees, and they embrace a value that is cheapened by their peers. Instead of being consumed by the darkness of negativity, they find the light and walk in it. When you look at your family and friends, what do you see: A bunch of plugged nickels or 1913 Liberty Head “V” Nickels that are worth millions? ← God or No God?